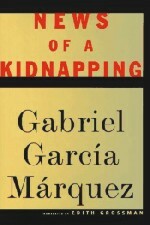 In his acknowledgements at the beginning of News of a Kidnapping, Gabriel Garcia Marquez reveals that he was well into a first draft when he decided he needed to broaden the focus of the story he was telling. He had set out, at her suggestion, to describe the experiences of a single abductee, Maruja Pachon, kidnapped by narco-terrorists in November 1990 and held for over six months, but perhaps he needed to consider a larger picture. Maruja, wife of a prominent politician, was one of 10 people to be held by the forces of drugs baron Pablo Escobar, as a way of applying pressure on the Colombian government. Escobar wanted to negotiate surrender, but on his own terms, which absolutely did not include the possibility of being extradited to the United States. Extradition was the authorities' trump card, the hostages were his and the bargaining between them was bound to be tortuous and highly unconventional. The book, as we have it, is a rather awkward mixture of personal drama and a chronicle of national trauma, with striking details alternating with relatively flat political digests and Marquez's tone wavering between the hostages' partial knowledge and something verging eccentrically on omniscience. Referring to the dismal conditions in which three women were held, for instance, he writes: '...it was inconceivable that one of the largest trans-national enterprises in the world did not have enough compassion to provide humane conditions for its kidnappers and their victims.' This slightly deranged comment isn't ascribed to any of the women, but if it represents Marquez's thinking it shows an odd naivety: Escobar may in some sense have been taking on the State, but his resources were different in kind, and, as the book makes clear, the guards were closer to being disposable than the hostages. They had no exchange value. Marquez maintains a discreet absence from his own prose, but he is too large a figure in Colombian life to disappear altogether. After all, when a bereaved mother holds a press conference in which she announces, 'This is the story of a death foretold,' she is echoing the title of one of his novels. Though it is Marquez's name on the title page that will ensure that this book is read in many countries, he hasn't risen to the challenge of telling his country's recent history to the world. His first career was as a journalist and foreign correspondent, but the frame of reference here is stubbornly parochial. It isn't helpful outside a Colombian context to say that two men will be confronting each other 'Santandarean to Antioquian', or to be told that a hostage is 'an emotional, impulsive man, easily moved to tears: the image of his father'. Escobar himself appears as a character only towards the end, which may be both a political and a literary weakness of the book. Marquez tends to pass on his witnesses' premonitions and intuitions without any filtering irony, but if it is true that Maruja's husband, meeting Escobar, perceived him as 'different from all the other men he had ever seen in his life' if he was not just an interchangeable thug but someone who shaped events then he demands a larger place in the book. The fragmentary portrait we do get is composed of bravado, shrewdness and derangement. This was a man who displayed the small plane used to export the first shipment of cocaine by the entrance of his private zoo, 'as if it were a national monument', who made his minions conduct insane conversations on the phone, so that real messages would be screened by nonsense, who travelled incognito in a fake public bus along real routes, a bus full of his bodyguards masquerading as passengers, taking the wheel himself, for fun. Presumably, in Colombia, the know-ledge of which hostages survived and which did not is branded on the national consciousness. For readers in other countries, there is the queasy possibility of reading the story of Maruja and the other captives as if it was a thriller. The other captives were often exasperated by her fatalism, hysteria and regressions to childishness distortions of character, which she could only have put into context if she had been allowed to survive. Marquez's handling of the personal narratives doesn't foreground the sufferings of this most forlorn of the hostages, but he makes them easy to imagine. Everything for the hostages was turned upside down. Their guards might be companionable, abusive, fawning, fatalistic or sentimental, or everything by turns. Rescue was what the hostages and their families most dreaded, as being likely to end in carnage. When released, captives would honour the guards' request that they exaggerate the remoteness of their hideaway, for everyone's safety. One prisoner deduced early in his confinement that he was being held in a well-populated part of Bogota, his suspicions confirmed when a pizza he had asked for arrived five minutes later, still hot from the oven. These merits certainly offset the book's weaknesses as a rounded portrait of Colombia in turmoil. But perhaps the first plan was the best after all and a tightly focused narrative with no explicit political dimension would retain most of what is strong here and exclude most of what is not.